Update 06/20: We added 11 more companies and removed 5 companies. Update 05/31: We added 21 more companies and recategorized 3 companies. I’m happy to release our very own Canadian Marketing Technology Landscape inspired by Scott Brinker’s Marketing Technology Landscape Supergraphic. It took three months to build this landscape completely from scratch. Most time was spent trying to find every Canadian Martech company. And, Photoshop. Lots of Photoshop! We’re not experts but we did our best. Some companies are in more than one category because their solution spreads across multiple areas or they have multiple solutions. Our main sources for finding companies included Chiefmartec, Heinz Marketing Landscape Directory, BetaKit Canadian Startup Map, Mattermark, Capterra, and Google. This is not a definitive guide to the Canadian Marketing Technology Landscape. If we missed your company or you feel your company has been miscategorized, please let us know in the comments. We came across many agencies and consulting companies, but did not include them unless they had their own proprietary technology offering. Feel free to use this infographic in any form. We just ask that you credit us when you do. We need to support our fellow Canadians and it’s our hope that this Martech landscape increases the awareness of Canadian solutions available. 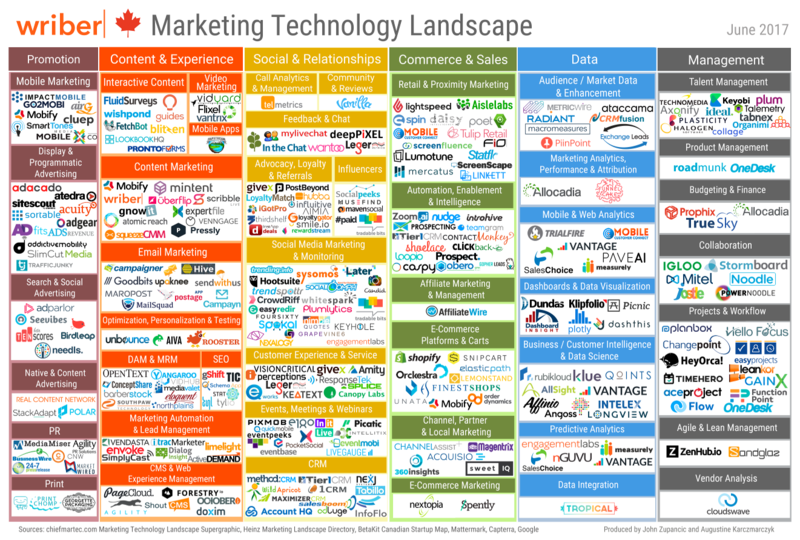 Approximately 5% of Martech companies are right here in our backyard! Next time you’re looking for a marketing solution, check here first. AdLuge – allows you to see all clients on one page, review lead trends, review performance trends, review meeting statuses, create opportunities, and review sales trends. Please let us know in the comments if we missed your company or miscategorized you. We would love to make it right!